EMH, Inc.® (Engineered Material Handling), now celebrating our 25th anniversary, is a full line manufacturer of Overhead Bridge and Gantry Cranes, plus Wire Rope Hoists, Endtrucks and Controls for loads to 500 tons. NOMAD® Freestanding Bridge Crane Systems with capacities to 10 tons. All the components needed to install a freestanding crane, including standard radio control. 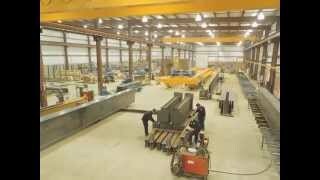 AL Systems™ Aluminum Workstation Cranes for loads to 2200 lbs. Single and double girder, free standing and ceiling mounted, jibs. EMH Standard and Engineered Wire Rope Hoists. Single and double girder models for capacities to 500 tons. EMH Endtrucks. Single and double girder, top and under running, bogies. Established in 1988. Certification to ISO 9001:2008 Standards for the design, manufacturing, installation and servicing of overhead cranes.